His Excellency the Governor-General Sir Tapley Seaton; His Excellency Holger Michael, Ambassador Extraordinary and Plenipotentiary of the Federal Republic of Germany; Cabinet Colleagues; Director of the National Archives, Mrs. Victoria O’Flaherty; other Government officials; Germany’s Honorary Consul in St. Kitts and Nevis, Mrs. Denise Parris-Mertins, other specially invited guests, members of the media, Good Morning. It is my great honour and delight as Prime Minister and as the Minister responsible for the National Archives to be here with you today at Government House. 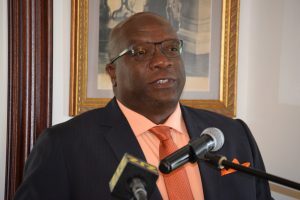 The launch of www.historicstkitts.kn represents a significant achievement and milestone for the St. Kitts and Nevis National Archives, which is the Federation’s repository of Government and private records. Today, it is my pleasure and privilege to address you on the subject of the Archives’ Role in Heritage Development. Significantly, the National Archives stores the consciousness of our nation. In essence, it is our memory bank. The prestigious institution preserves our forebears’ thoughts, feelings and experiences while highlighting the conditions of their personal and collective existence and surroundings. Thankfully, in recent times, the invitee list has been dramatically expanded, resulting in Government House and our modern-day Governor-Generals welcoming tens of thousands of our people from all walks of life for many occasions, both solemn and festive – from New Year’s and Independence celebrations to investitures and elderly luncheons, you name it – and you can read all about these events right in the newspapers housed at the National Archives. When you enter the doors of the National Archives at Government Headquarters from 8:00am to 4:00pm on weekdays, you gain free admission to the soul of our nation. You gain access to our rich history and identity, which have been shaped by our struggles and our successes. Indeed, the sting of poverty has made us a resilient people ever reaching for greatness. Therefore, the captivating stories documented in the trove of records stored in our National Archives are testament to the fact that, rather than being a life sentence, adversity – and the way we respond to it – can be a conduit to greater things. This is indeed our patrimony, and today we rise like the phoenix from the ashes and from the often-thwarted aspirations of our predecessors, starting anew with a world of possibilities before us. It’s amazing to consider that our forebears attained Universal Adult Suffrage in 1952 – thirty-one years prior to 1983 – and now, thirty-five years after our Independence, our great nation and resilient people are free to exercise our own franchise and self-determination. Indeed, when I addressed the nation to officially open the annual History and Heritage Month of Activities in February, I expressed confidence that our people shall not be felled like a storm-battered tree, but instead continue to stand upright and tall, deeply rooted in tradition and incredibly proud of all the remarkable achievements we have attained despite our struggles. 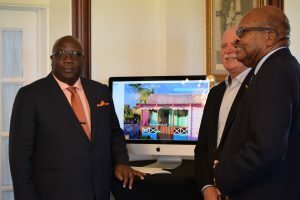 Today’s launch of the beautiful and impressively thorough website, www.historicstkitts.kn, furthers our journey of national pride and expands the scope, reach, impact and importance of our national records. Importantly, this digital technology brings our national records into quick and easy contact with our schoolchildren and teachers, our tourists and prospective visitors, as well as people all around the world who want to trace their ancestry or research the history of our country. Historic St. Kitts provides an easy entry point to St. Kitts and Nevis for the 1.5 million cruise passengers we will welcome to our shores this year and every year – even before they get here. The website will also enable our potential investors and future citizens to familiarize themselves with our rich, eclectic culture that fuses African customs with those of the British, French, Portuguese, Spanish and a host of other cultures. It will also provide another avenue for our many nationals who are abroad to stay connected to their beloved homeland and to also introduce it to their children and grandchildren, who will get to experience its charming culture, beauty and history even before boarding a plane. In that vein, this new website makes a perfect companion to www.nationalarchives.gov.kn. Importantly, too, the content on the old Historic Basseterre website has been incorporated into the sleek, new Historic St. Kitts website, www.historicstkitts.kn. I use this opportunity to publicly express our deep appreciation to the Federal Republic of Germany for its generous financial support to the National Archives. The Federal Republic of Germany and the Federation of St. Kitts and Nevis have built up a good relationship based on cooperation and mutual trust, and my Government looks forward to strengthening the bonds of unity and partnership throughout the coming years. 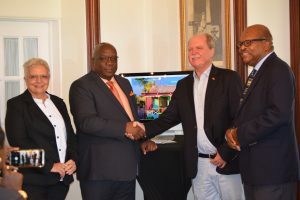 I am happy to share with you that Germany has kindly assisted the St. Kitts and Nevis National Archives with the digitization of documents, resulting in countless important national documents and records being made more accessible to researchers. Moreover, Germany has assisted the National Archives in successfully launching this website, and we are very grateful. I say a big “thank you” to Germany’s Ambassador His Excellency Holger Michael, who is based in Port of Spain, Trinidad, and ask him to convey our sincere gratitude to German President His Excellency Frank-Walter Steinmeier and his people. I also take this opportunity to congratulate the Director of National Archives, Mrs. Victoria O’Flaherty and her staff for reaching this milestone. My commendations also go to Genesis Creatives, the local web developer that created the site. I went on the site for the first time yesterday, and I am quite impressed with what I saw, and more importantly I discovered new things about my beloved country that I have the honour and privilege to lead. The website’s tagline says it all: discover us for yourself. I invite each and every one of you to log on to www.historicstkitts.kn and share the link on social media and via email. It’s too valuable a resource to disregard. With the public’s support and with the National Archives’ effective protection and preservation of our heritage assets, we will lay the foundation for future growth and development in every sphere, including those that are academic, cultural, economic, political, social and technological, for knowledge is power and knowing our history empowers us to build a better future.